The 4th game of Oui Title Match between Oui title holder Habu and challenger 8-Dan Kimura started today. You can check on this website. Both players have eight hours of thinking time. It takes two days to the end, and the first day was over at 6 pm. Both castles are called Yagura. 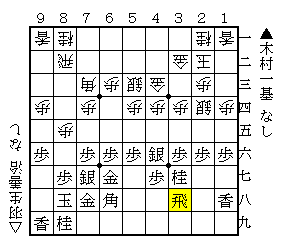 Kimura (sente) chose Yagura, Silver-46 Strategy, which is popular among professional players. This strategy is aimed to attack from 3rd file. The knight would jump into 25, and open fire with ▲P35, after that, in reply to △Px, sente attacks like ▲P15 △Px ▲Sx35 △Sx ▲Bx. Before ▲P35, throwing in ▲P55 △Px to stop the bishop's diagonal is also possible. The meaning of the lance on 18 is to avoid the bishop's diagonal beforehand. If lance is on 19, there would be △P45 when the knight jumped into 25. The silver has to retreat to 37. Actually, △P45 is also considered when the lance is on 18. It would proceed with ▲Sx △B19+ ▲B46 △+Bx ▲Px. Habu started the edge attack to gain a pawn in hand because Kimura pushed ▲P96. The pawn would be used to break sente's attacking formation, such as △P45. If taken with the silver, gote could capture the silver with △P*44. Instead of ▲P96, he could use the one move for attacking. But, it's an option. He is famous for good defense among shogi fans. Against △Lx95, ▲Lx △Bx used to be played, however, have been almost never seen in recent official matches because of the weakness of 9th file. 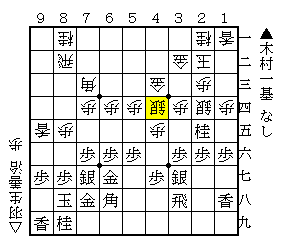 △P64 was a new move of Habu. It was a bold move because the bishop's diagonal stopped. In reply to △P45, sente couldn't take it as I mentioned earlier. The silver must retreat. △S44 which advanced the silver was today's last move. I suppose sente will attack with ▲P46 △Px ▲R48 to prevent the attacking formation from being oppressed. It's still an equal game. I'm looking forward to watching this game tomorrow. You predicted next moves well. I have watched the game and there was one point in the game, where I considered different lines than what was played and I thought they may be interesting. At move #100, Habu goes G4c-3c, but I thought Sx2e taking rook may work just as fine. If black Px4c+, White R*4h and it's threatning to either takeout the promoted pawn at 4c(which would make it a trade of dragon and pawn for a gold, which is not bad), or if black prevents that, G-6g is a threatmate. If black defends the threatmate, and leaves pawn at 4c unprotected, of course, once Rx4c+ there's a fork with gold G*5c, but Rx6d(taking out bishop) and either Gx4c, which allows Rx6e, nice influence of rook in the 6th file, or Px6d(taking out rook), but that allows black to recapture the gold and there's no attack, which is not satisfactory for black. So I think black would go for Gx4c, which still has great attacking options, but white has also achieved good influence(although somewhat weaker) on black's king. And what is also good point of the initial Sx2e, it creates another square for king to run. What do you think about these lines? Did I miss something? Or they are not very satisfactory for white? You are thinking many moves. In these lines, when R*4h, P*2d is the best for black. This move is a threatmate with S*3a, K1c, Px2c+, Kx2c, G*2b, Rx2b, Sx2b+, Kx2b, B3a+, Kx3a, G*3b. So, White has to take it with gold. The king lost the way to run above. And black plays S*3b. This move is also a threatmate with B3a+. The rook need to take it. 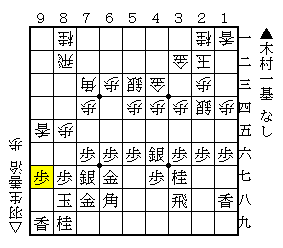 But, there is a checkmate with +Px3b, Kx3b, R*3a, K2c, G*3c, Nx3c, S*3b, K1c, Rx1a+, G*1b, B3a+ like tumeshogi. Even if there is no checkmate here, black would not be checkmated on the next move. So, black will win. If white plays R4c+ when P*2d, G*3c would become a severe move this time.